Reactions by religious leaders to Pres. 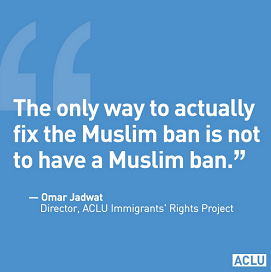 Trump's 1st Muslim ban. Trump issues second Muslim ban. More Reactions to 1st Muslim Ban. One hundred individual Evangelical Christian leaders took out a full page ad in the Washington Post. 1 It was placed there in the name of World Relief, an evangelical Christian organization that specializes in settling refugees in the U.S. It was addressed to the President and Vice President. Thousands of more leaders have endorsed the message online. 51% of randomly selected U.S. adults oppose the ban; 46% support it. When asked about Trump suspending indefinitely immigration of Syrian refugees, the public was opposed 70% to 26%. U.S. adults disapprove of how Trump is handling immigration issues by 56% to 41%. U.S. adults disapprove Trump's handling of terrorism issues by 49% to 44%. "Message to President Donald Trump: 'Give me your tired , your poor, your huddled masses, yearning to breathe free' still has profound resonance with Americans. "Significant pushback on immigration tells the President that many voters are not on board with a ban on refugees and that voters [who] are strongly opposed back those most threatened: Syrian refugees." The polling group conducted a poll at the two-week point of Trump's presidency. They found that male adults support President Trumps performance by 50% to 43%; women disapprove by a much larger margin: 58% to 35%. "President Trump's executive actions ending the refugee resettlement program and barring Muslims from entering the United States is a dark stain on American history. I fear students in the future will learn of these actions along side our failure to admit Jewish refugees fleeing Nazi occupied Europe. We know now what a mistake that was, can we not see the error here? The WHCA dinners have been held annually since 1921. Few presidents have missed ny. John F. Kennedy threatened to miss the 1962 dinner unless female members of the WHCA were allowed to attend; he succeeded in eliminating the gender bar. Ronald Reagan did miss the 1981 dinner because he was recuperating from an attempted assassination. Trump will be the first President of the United States in three decades to not attend! His tweet received 113,758 likes and 23,248 retweets as of FEB-27 at 1 PM, ET. President Trump issued a new executive order that is less extreme than his original order which had been stalled in the courts. It goes into effect on MAR-16. Travel restrictions no longer involved Iraq. They would continue with six out of the seven original countries: Iran, Libya, Somalia, Syria, Sudan and Yemen. "Muslim-majority countries where Donald Trump does business [were] left untouched by travel ban. Wealthier countries which could pose a risk of terror but do business with the Trump Organisation will not face restrictions. ..."
It is worth noting that almost all of the nineteen terrorists who demolished the World Trade Center in 2001-SEP-01 (911) were from Saudi Arabia, which is not one of the six countries included in the ban. None of the remaining 911 terrorists were from one of the banned countries either. Thus, the claim by President Trump that the executive order was needed for homeland security is pathetically weak. 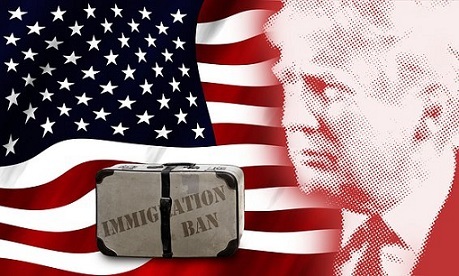 The second executive order gives federal government departments ten days to adjust their procedures to handle the ban before it becomes effective on MAR-16. That is much better than Trump's first executive order which went into effect immediately, and threw airports and other entry points into the U.S. into chaos. The ban on travel to the U.S. from Syria is no longer of an indefinitely long duration. "Playing with the lives of refugees due for resettlement is unconscionable. This order could affect families who have escaped the rubble of Aleppo, or fled war and famine in Yemen. These are people fleeing conflicts and other serious threats, and they deserve protection. Banning people from these countries will not make America safer. This latest executive order is a direct attack on freedom, justice and dignity. It is a clear violation of international human rights law." "... we've been urging the Canadian government to protect people at risk under new US policies. Now we must call on President Trump directly to stop abusing his power, to uphold the US' commitments to the world’s most vulnerable refugees and to end the discriminatory travel ban." Except for people in medical emergencies, I cannot think of another group that is more in need of support than refugees who are attempting to escape violent, inhuman, hopeless and life-threatening situations in their home countries. The Golden Rule -- which calls for a person to treat others as that person would wish to be treated by others -- precisely applies here. The Rule is found in throughout the world among Agnostics, Atheists, all the major religions, and all the minor religions -- including even Satanism -- that we have investigated. Islam, the second largest world religion. Copyright © 2017 by Ontario Consultants on Religious Tolerance.